Let’s face it: wine shopping can be a little overwhelming. Add in the prospect of finding a bottle that’s a good deal, and it get’s even more complicated. 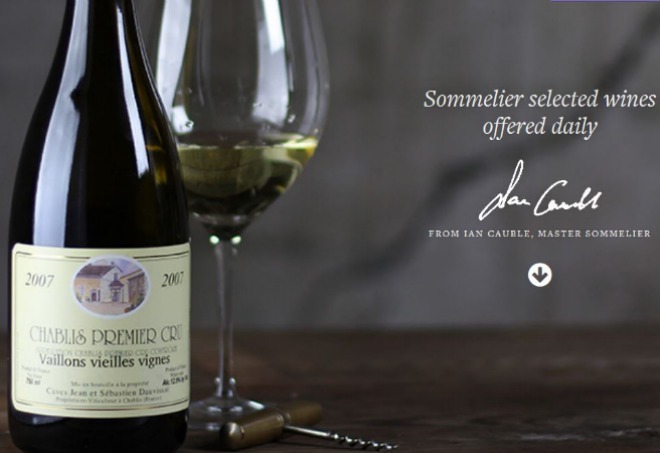 That’s why we’re pretty excited about SOMMselect, a new website that highlights one wine (usually within the $20-$50 range) from across the globe every day, complete with backstory, to be shipped from Napa Valley to your door. The project is the brainchild of 34-year-old Ian Cauble, who was featured in the recent documentary “Somm,” which catalogued the journey of wine experts vying to pass their master sommelier exam (spoiler alert: Cauble passed). How does the website work? Sign up or visit and you’ll see a featured wine selected by Cauble that often represents a “lesser priced bottling that still offers outstanding quality and exceptional expression of place,” which can mean anything from a lush Nebbiolo DOCG from Piedmont, or a hard-to-find Pinot Gris from Sonoma County. Of course, you have to be quick: each deal only lasts for 24 hours. Every wine selection also includes a well-written short story detailing the winemakers behind it, how it is made, its region and soil type, and pairing suggestions. There’s even a handy value chart that rates characteristics like fruit, earth, tannin, body, acid, alcohol. Shipping (which generally runs around $10) is free if you order three bottles or more. For the wine neophyte, it’s a great way to immerse yourself in the language of somms while only taking a few minutes out of your day. Next articlePop Quiz: How Much Do You Know About Donald Sterling?